SYNOPSIS: 52 short, immediate and practical tips to kick-off your learning, improve your skills and sustain your progress at school, at work, at home and at play – by journalist and author, Daniel Coyle. PERSONAL NOTE: I love books like The Little Book of Talent. Like Templar’s Rules of Work, Life, Wealth etc… they’re short, succinct and crammed with practical ways to make life more effective. But they come with a risk: “As to methods there may be a million and then some, but principles are few. The man who grasps principles can successfully select his own methods. The man who tries methods, ignoring principles, is sure to have trouble.” – Harrington Emerson. So, if you’re new to learning about learning, be careful how you use The Little Book of Talent – and be especially wary of the unhelpfully-simplistic neurobiology in the appendix. You will, in short, get the most out of these ideas if you come at them from a wider base of reading (e.g., Coyle’s own Talent Code). 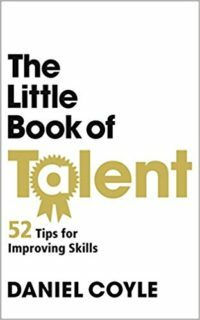 Another risk with books like The Little Book of Talent is being so overwhelmed that it’s hard to know where to start. There’s a tendency to read the book, enjoy a premature sense of improvement and hope that everything will sink in by osmosis. Note down your overall verdict on the weekend. That may seem slow but such a systematic approach and realistic demand on your time will maximise your odds of turning your favourite points into sustainable habits that will transform your learning. Sustain Progress – Combine persistence with creativity to keep pushing yourself and progressing. Start with who you want to become – Find heroes and use their stories, photos and videos to guide and motivate you. Spend 15 minutes a day engraving the skill on your brain – Watch perfect versions intensely and repeatedly until you can feel their execution clearly. Steal without apology – Identify critical moves – specific details and concrete facts – then incorporate them into your method. Buy a notebook – Make time daily to introspect on your performance and create plans for your ideas and goals. Be willing to be stupid – Take at least one risk per week, use failure as feedback for improvement. If you don’t fail, you’re not reaching. Choose spartan over luxurious – Eliminate distraction by working in a simple and frugal environment. Before you start, figure out if it’s a hard or soft skill – Hard skills need consistent and precise execution (often involving a coach or teacher in the early stages). Soft skills are reactive, adaptable and creative. To build hard skills, work like a careful carpenter – Build strong foundations by perfecting each sub-skill slowly and precisely before moving on. To build soft skills, play like a skateboarder – Combine exploration of many new challenges that force you to stretch and experiment with clear feedback and introspection. Honour the hard skills – For combinations of hard and soft skills, prioritise training the hard skills – even when you’re an expert – they’re the foundation of your talent. Don’t fall for the prodigy myth – Success is a combination of luck, hard work, smart work and natural talent – in that order. Pick a high-quality teacher or coach – Find someone attentive, fundamentals-oriented, action-oriented, precise, unflinchingly honest and experienced. Find the sweet spot – Craft practice that hits the spot between comfort and survival; characterised by a feeling of flow with a 50 – 80% success rate. Take off your watch – Measure practice in high-quality reps, not time. Break every move into chunks – Break skills into their smallest chunks; master them; then link them to new chunks. Each day, try to build one perfect chunk – Set a daily SAP (smallest achievable perfection) and focus on getting it 100%, consistently correct. Embrace struggle – Embrace emotional frustration and discomfort – your best-self lies on the other side of it. Choose five minutes a day over an hour a week – Make practice habitual, efficient and effective by doing less, with more focus, every day. Don’t do “Drills.” Instead, play small addictive games – “If it can be counted, it can be turned into a game.” – score and track progress, then beat it. Practise alone – Tune your personal sweet spot and hone your discipline by demanding the best of yourself when no-one else is watching. Think in images – Practise visualising actions and feelings vividly – it improves performance and creates a model for internal feedback. Pay attention immediately after you make a mistake – Attend deeply to errors as soon as they happen – take them seriously but not personally. Visualise the wires of your brain forming new connections – Depersonalise mistakes by framing them as chances for new, better connections in your brain. Visualise the wires of your brain getting faster – Give reps meaning by visualising them develop your neural country-roads into superhighways. Shrink the space – Constrain practice space to force precision; use models and miniatures to create birdseye views for strategic thinking. Slow it down (even slower than you think) – Works like shrinking, particularly for hard skills, by highlighting weakness and forcing precision. Close your eyes – Embrace blindness to sweep away distraction, nudge yourself to the edge of your ability and train your other senses. Mime it – Eliminate cues and force yourself to reach by eliminating equipment and training just the purest form of the movement. When you get it right, mark the spot – Consciously and immediately rewind and internalise the build-up and feeling of your first perfect rep.
Take a nap – A 20 – 90-minute nap in the middle of the day or after training boosts energy, improves creativity and strengthens memory. To learn a new move, exaggerate it – Push the upper and lower extremes of any activity to help identify and hone in on its sweet spot. Make positive reaches – Always focus on reaching the positive outcome you want and don’t think about the mistake you want to avoid. To learn from a book, close the book – Use active recall – learn by challenging yourself to recall and summarise what you’ve just read. Use the sandwich technique – Sandwich an incorrect move between two correct ones to highlight and learn from the mistake. Use the 3 x 10 technique – Practice things 3 times with 10-minute breaks in between sets to learn them most effectively. Invent daily tests – Find ways to turn practice into quick, fun games with measurable outcomes that isolate accuracy and reliability. Reaching and repeating – Are you pushed repeatedly into your sweet spot? Engagement – Are you interested and emotionally immersed? Purposefulness – Does it target the specific thing you want to improve? Strong, speedy feedback – Does it clearly tell you how you did and how to improve? Stop before you’re exhausted – Unless improving toughness or building solidarity – quit before fatigue affects performance. Practice immediately after performance – Your mistakes will be fresh in your mind and most easily fixable. Just before sleep, watch a mental movie – Pre-visualising performance improves it (and boosts motivation, toughness and confidence). End on a positive note – Finish every practice session with an uplifting reward (from a game you enjoy to an actual piece of chocolate). Connect emotionally – Build trust and show that you care in the first few seconds of feedback. Break it down – Favour short, targeted messages over long, team speeches. Be specific – Use concrete nouns and numbers to deliver feedback, avoid imprecise adjectives and adverbs. Use scorecards – Track what you want to change and make measures of long-term progress visible to everyone. Maximise “Reachfulness” – Use small, intense games to keep everyone active and learning. Avoid lines and waiting. Foster independent learning – Step away whenever possible and create habits that let students guide themselves. Embrace repetition – It’s not a chore, it’s your most powerful tool. Have a blue-collar mindset – Get up each morning and go to work honing your craft, whether you feel like it or not. For every hour of competition, spend five hours practising – Competition is great for testing skills but terrible for improving them. Don’t waste time breaking bad habits, build new ones – For an excellent approach, see Duhigg’s The Power of Habit (crunch). To learn it more deeply, teach it – For more, see this post on Learning Through Teaching (article). Give new skills at least eight weeks – Learning takes time – give your brain the time it needs to grow. When you hit a plateau, make a shift – Change your approach to knock yourself out of autopilot and back into your sweet spot. Cultivate your grit – “A quitter never wins and a winner never quits” – Napoleon Hill. For more, see Duckworth’s Grit (Amazon). Keep your big goals secret – Don’t let your mind take the credit before your body goes the distance. Think like a gardener, work like a carpenter – Talent grows slowly, so work steadily, train strategically and trust in the process. Thanks for this summary. All of the tips are worth keeping in mind while studying. Thanks a lot. Thanks, Tushar. I’m glad you enjoyed it! It’s a great little book to keep to hand and review whenever you’re starting a new project.